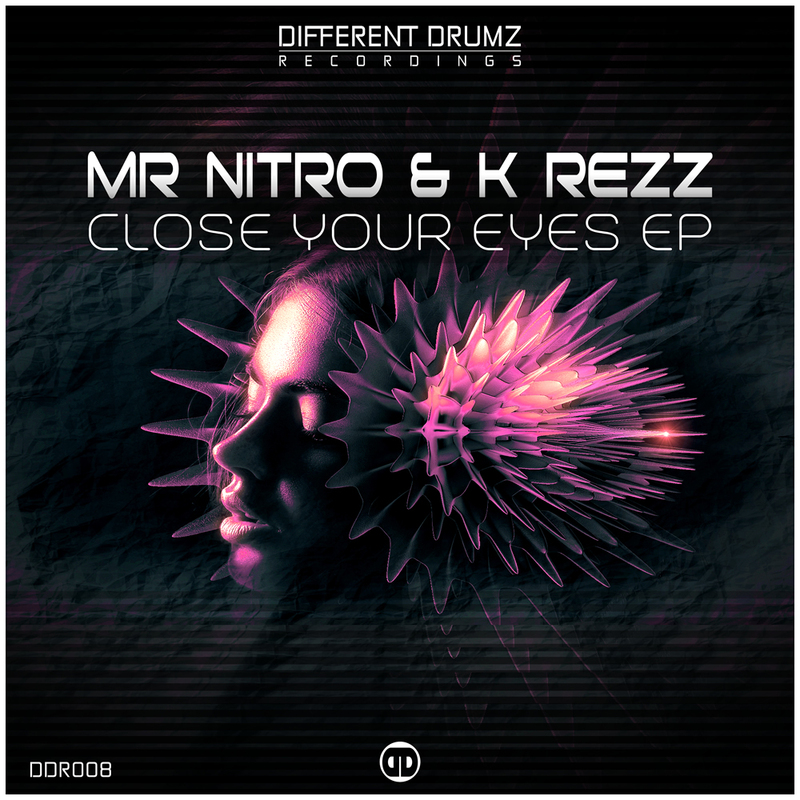 It’s been well overdue but Different Drumz front man ‘Mr Nitro’ drops his debut release on the mighty Different Drumz Recordings in collaboration with a new artist to the label based in Seville, Spain ‘K Rezz’. This quality 4 track EP features four varied and well rounded drum and bass tracks hitting various corners of the dnb spectrum from liquid funk to jungle influenced sounds and all laden with smooth and soulful elements, clean, solid beats and powerful soul shaking bass lines to get anyone’s feet moving.. We are very proud to present the ‘Close Your Eyes EP‘! The title track ‘Close Your Eyes‘ sets the scene for the EP with a subtle intro of ethereal pads & ghostly vocals punctuated by metallic drums then dropping in with deep sub bass notes and gorgeous euphoric vocal cuts, the pattern of which evolves as the track progresses, rolling into the breakdown where the track opens up to a switch of bass with added phrases and LFO accompanied by organic bongo’s to add movement & momentum. The second track ‘Time‘ opens with classic liquid atmospheres drifting from ear to ear and lush pads rolling into a drop of classic 808 bass notes and sharp drums with a lattice of intricate and driving chopped breaks as the track takes you into a sublime juxtaposition of hard drums and liquid euphoria with the second drop tipping its hat to 90’s jungle influences. The next track ‘Invisible Rain‘ instantly draws you in with an atmosphere of subtle rainfall sounds that give the track its name before the addition of sneaky glitches along side a stomping kick and beautiful reverse piano licks as it approaches the drop. The track then adds power and depth with its strong bass line that progresses and grows as the track continues; crisscrossed with intriguing violin plucks, percussive hits and flourishes. The final track ‘Progress‘ goes in with an upbeat melody than can be easily imagined floating over in a teasing mix, the clean beats roll in, filtering down into throws of wobbling and varied bass which then darkens and becomes the focal point into the next phrase, eventually teasing back in with it’s signature melodics. This is yet another quality addition to the Different Drumz Recordings release catalogue that has a little something for everyone feeling their soulful yet powerful bass driven drum and bass and is sure to shake the floor of the dnb scene.